Saint er en smule overstabil fairway driver og kan flyve lidt længere end en River. Saint er en smule overstabil fairway driver og kan flyve lidt længere end en River. 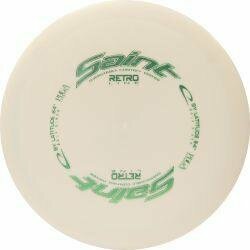 Saint is slightly overstable on drives up to 350ft and has good carry. Compared to already existing models it is close to being a longer River. We have also learned that people with different playing styles and general conditions around them have different views on our molds so we prefer not to be too specific in our descriptions. Speed: 9 Glide: 7 Turn: -1 Fade: 2 About Opto: Opto is made out of some of the world’s most durable plastics. It comes in a variety of beautiful transluscent colors. The Opto Line plastic has been developed to withstand severe punishment and extreme conditions better than other plastics. Den officielle disc til ultimate i blandede farver. The Mamba was designed to give maximum distance for minimal effort. The Mamba has more high speed turn than any of our long range drivers, so throwing into a headwind is not recommended. The DDx - We took our classic Distance Driver (DD) and gave it a little something special that will help all levels of players get further down the fairway with more control. Det her er Pro versionen af den berygtede fairway driver River. Giver mere stabilitet til dig der kaster hårdt. The Beast er en klassiker i disc golf - I det populære Champion plast. River has taken the market by storm and is a disc with GLIDE. It´s easy to throw and fits most player’s power and skill levels. Ny release: Samme fede glide som en Escape, men mere forudsigelig overstabil.